I started a Meredith Duran book some time ago and stalled out early on for reasons I can no longer quite remember. I know it wasn't the writing, which definitely struck me as adept. I think it was more to do with the setting and I not clicking. Also the sense I was getting that the characters were going to hurt each other—possibly at some length—before they found any middle ground. Either way, I wasn't up for it at the time. And then I'm fairly certain I went on to mix Ms. Duran up with Tessa Dare and forgot to return after trying and sort of spectacularly failing to engage with Dare's Spindle's Cove series. Which is why I'm very glad Fool Me Twice was brought to my attention a few days ago. It jogged my memory and I remembered I'd always meant to go back and investigate Duran's work further to see if there might be a better fit among her backlist. As it turns out, her most recent novel and I were destined to get on in spades. Olivia Mather has set her scruples aside in favor of staying alive. With her mother's husband's dangerous henchman lurking around every dark corner, she decides to use the only weapon she has and infiltrate the home of the Duke of Marwick. As a maid in the duke's home, she feels certain it won't take her above a week to root out his correspondence containing the evidence she needs to ensure the villainous Bertram will leave her alone for good. When she accidentally stumbles into the role of housekeeper, Olivia figures so much the better. But it quickly becomes clear that the home she has walked into is not so easily navigable as she presumed. For the duke is rumored to have run mad at the revelation of his dead wife's betrayal. He has not left his room in above a year. His terrified servants tiptoe about the house and shirk their duties. With time running short and her only hope residing in the duke's rooms, Olivia must take charge of the crumbling household and find a way to lure the crumbling man inside out into the light. "Have you a death wish?" he snarled. "Or have you, perhaps, lost the ability to understand English?" She backed away from him, angling toward the door. He matched her step for step, prowling like a lion on the scent of a lamb—not a comfortable analogy. But these innocent books. She was stumbling over them, gilt-edged, calfskin-bound, priceless. She must save them from him. She had one foot out the door when she caught sight again of the illustrated manuscript. She could not abandon it here. The poor darling! She lunged forward and snatched it up. "Put that down!" he roared. "You may keep them all," she cried. "Move the entire library up here, but you will not keep them on the floor!" She hopped backward and pulled the door shut in his face. It was no longer clear to him who was in control of this conversation. How absurd. He was not bound by her terms; in return for her answer, she could demand the moon, and it would make no difference to him. "Very well, then, answer me: why were you crying?" "Because I am not the person I hoped to be. And I dislike myself for it." That told him nothing. "What do you mean? Who had you hoped to be?" "Someone better. Someone who abided by her ideals." Christ. Blackly amused, he turned away from her toward the bookshelves. "Then we both were drawn here by the same mood. But I assure you, Mrs. Johnson, you will overcome your disappointment." He ignored that. "Good night to you." "You haven't yet answered my question." "Welshing," he said coldly, "is the duke's special privilege." "Very well, don't answer. But I will ask it anyway: why do you read Austen if you lack all hope for yourself? Why torment yourself with happy endings if you don't believe one is possible?" He stared at the books. This had gone too far. Why did she think she had the right to speak to him in this manner? Why did he constantly invite it? "You have every advantage." Her voice was fervent. "There is no reason you can't go back into the world, have everything you feel you've been denied. I tell you—if I had your advantages, I would remake myself!" Olivia took a long breath. It now sounded as if Marwick was banging things against the walls. Not his head, she hoped? Or perhaps she did. No, she couldn't wish harm to his brain. It might yet heal, and it had once been very fine. One of my favorite aspects of the narrative is how it continually refers to what has been lost for both of these individuals, engaging with the agonizing question of whether or not those things can (or should) be regained. To say nothing of how far they will go to stave off danger (in Olivia's case) and exact revenge (in Marwick's). Duran's style, setup, and execution requires the reader be rooting for both Olivia and Marwick in order to make it through the utter hell they hand each other on an hourly basis. In order to reach the point where their eyes finally open enough to see beyond the surface implications of their actions, which are admittedly questionable in a number of cases. I wondered a moment or two whether I might lose my grip on my affection for one of them. But then I do like my protagonists flawed. And I am not at all certain I would have responded to Olivia if she had been a little less ruthless or Marwick had he been a little more malleable. And because their innate admiration for each other is unwavering, I remained with them lo, unto the end. 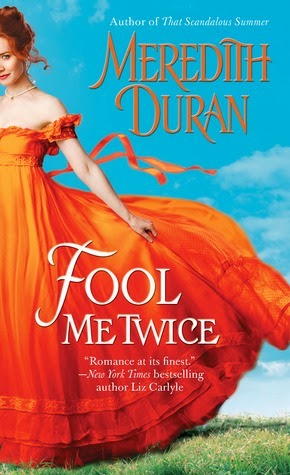 Fool Me Twice is a decided highlight among historicals and of my reading year thus far. Dear Author - "I don’t often get the intense reads I adore in such a well constructed form." Fiction Vixen - "Ms. Duran has given her readers another wonderful, captivating love story." Love Saves the World - "Her stories always pack an emotional wallop." Miss Bates Reads Romance - " . . . a sensitivity to the class issues of the day, a complex heroine, a flawed and compelling hero, wondrously good writing . . . "
Smexy Books - "While I did get into their romance, I ended the book not 100% convinced they would be happy together forever." Lol. They are totally my jam lately.